More and more people are heading high in the summer. PlanetSKI reports from the French Pyrenees. The French Pyreness is a region of extreme contrasts – from high peaks to lush valleys. There is wonderful cuisine and fascinating culture. Adrenalin action sports to gentle family activities. PlanetSKI reporter, Vanessa Fisher, has been enjoying the area with her young family. I visited last summer to see some of the extremities of the region and reported on it here for PlanetSKI. I fell in love with the Pyrenees in the summer months and was keen to see some more of this contrasting region. Down in the foothills is a sleepy little village called Madiran. Wine aficionados may recognise the name from the rich red wine which carries its name. Madiran wine, is one of the most well-known red wines from this part of France. The Brumont family being one of the biggest growers and exporters of this wine. The vineyards grow on the south facing slopes of this little corner of the Hautes-Pyreenees. What isn’t little is the Chateau which sits amongst the vineyards – Chateau Montus. When I visited it was about to host a huge wedding party. The converted outbuildings were decked out with linen and flowers but we managed a quick peek in to another of the vast buildings which houses the enormous metal cylinders where the wine is produced and stored. I’m not a huge wine fan (unless it’s fizzy) but the beautiful old chateau sitting with its panoramic views across the valleys was quite the setting for a wedding reception. The lady on reception went down to the cellar to dig out a couple of bottles of 2010 Montus, an excellent year for this wine…apparently. On the other side of the region, heading down towards the Med and nestling up against the Haute-Garonne department is the Barousse Forest. With our wine stash we were in search of some new treehouses that have been built up in the woods. This is where Sat Navs struggle, small mountainside roads, where they get confused with the switch-back roads and tiny paths and tracks. After a couple of interesting routes, we drove into another tiny village, Cazarihl. Just off the ‘main road’ through the village are Les Cabanes de Pyrenes. A local couple have invested in a small section of the forest and built three bespoke treehouses, one sleeping two, one sleeping four and a larger treehouse sleeping seven. That was to be our home for the night. As a family overnight treat it was absolutely idyllic; giant wooden games are scattered through the surrounding woodland, and if you want to hike, the owners are clearing an ancient path which runs north from the treehouses up into the woods beyond. Each treehouse has a different entrance, the duo with its circular stairway and a ladder across to a seating area ‘a deux’. Ours had an easier wooden staircase, safe for the children, a lovely outside balcony and fun swinging chairs underneath. Inside was spacious, with a double raised bed, two sets of bunks and a small single under the double. Small details such as the intricate carving around the windows and the lovely bed linen makes an overnight in these treehouses seem luxurious. The naturally heated hamman (like a small Jacuzzi) was fired up for us to relax in and for dinner we ate in the on-site Kota grill. You can cook local meat over the fire in the centre of the little hexagonal building and the owners prepare potatoes and salad plus homemade tart and breads and dried meats to accompany. After more wine, sleep comes easily, no noise, just the sounds from the woods and pitch black all around. Gentle fairy lights inside enough to keep the children’s fears at bay! In the morning, after hauling a wicker basket full of fresh croissants, hot coffee and chocolate up and over the balcony and devoured around the little central table, we moved back down to the valley to discover some ancient caves and hand prints. The Grottes de Gargas caves take you way underground where, with a guide, you follow the routes through the limestone tunnels and discover a series of 27,000 year old hand prints and animal carvings. Our guide spoke in French but quickly translated in to English. Once again we were late for our set tour but luckily managed to tack on to the back of the tour which had only just begun – booking in advance is essential. Onwards up the valley still at the very edge of the Hautes-Pyrenees and then crossing the high pass at Col du Peysourade brought us down in to the Louron Valley. PlanetSKI has stayed in this sleepy valley in the summer before. At the top of this valley is Loudenvielle with its lake and outdoor pool and slides. We spent a fabulous day here using the pedalos on the lake before heading in to Ludeo with its fun slides and warm outside pools. We’d travelled from the furthest tip of the region bordering Gers, across to the Mediterranean side and finally back in to the heart of the Hautes-Pyrenees. Who says the mountains are just for winter? See here for more information about holidays in the Hautes-Pyrenees. 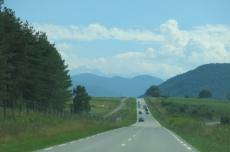 It is the new Pyrenees Road Trip. It takes you over many of the famous Tour de France ‘cols’ zigzaging between France and Spain, and to some of the most beautiful sites of the Pyrenees. A Road Book accompanies you on this trip. It is free and full of practical advice, with lots of good addresses for accommodation, full of information on the best sites to visit, the places for outdoor activities, the spa centres, the best restaurants… It is not just another tourist guide, only the best sites recommended by clients are included. It is set out as a daily diary and has ideas for easy walks, unusual places to visit, and is full of interesting stories. Its valuable information makes it the perfect guide for a great adventure. It is something that should be done at least once in a lifetime, whether integrally or for just a few days. On the basis of two sharing it only costs €494 per person for 8 days, €335 for 5 days and €260 for 3 days (transport not included). The richness of the flora and fauna, together with the many lakes and sublime scenery, have made the Néouvielle Reserve a subject for detailed study and attention. 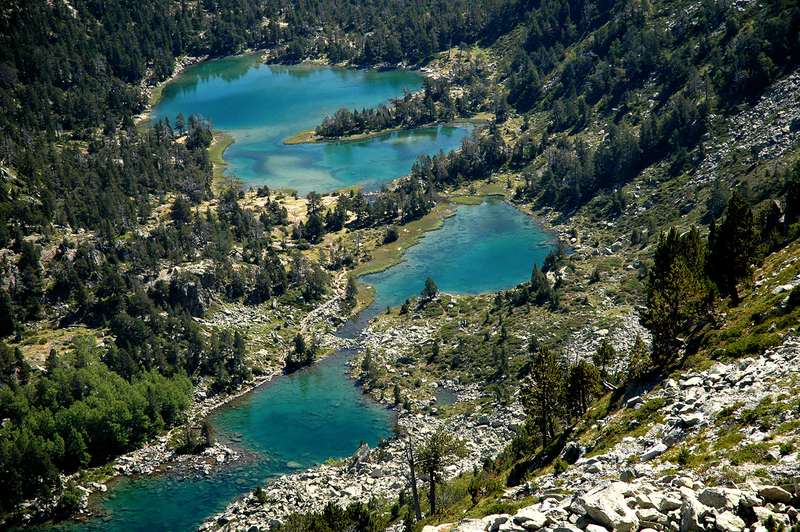 Created in 1936, the Néouvielle Nature Reserve is one of the earliest established in France. The area covers 2,300 hectares with more than 70 lakes (Aubert, Aumar, Orédon, Cap de Long, Laquettes) and pools in which more than 570 species of algae have been identified. The area is covered with Pins à Crochets (a dwarf mountain pine), the tree growing at the highest altitudes in Europe. This famous range is bordered by the massive limestone walls of Barroude and the Pic Néouvielle at more than 3000m. A paradise for walkers, there are many possible circuits and the grand tour of the Néouvielle can be done staying in the 5 refuges, newly linked for summer 2016. PARC ANIMALIER DES PYRENEES – Up Close and Personal! The Pyrenees Animal Park, ranked among the top in France , opens a new hut sleeping two adults – with windows overlooking the Bear Park. Hike with a Huski ! Lourdes, the 2nd most visited city in France, and famous for its pilgrims has a fun ‘city beach’ for all this summer. New – two 1 hr 30 themed walks discovering the history behind Lourdes from 1858 when before and after Bernadette’s apparitions and Lourdes in medieval times when it was known as ‘Lorda’. 15 artists create a walk in Arras en Lavedan, a village of 500 inhabitants, near Argelès-Gazost on the theme of Saint Jacques de Compostela, a mixture of history, old artifacts and modern art accessible to all. A new delicatessan open on the Lourdes-Gavarnie road. Specialising in the local Black Pork de Bigorre. Visit the factory, see the hams being salted and taste and buy products. Discover the different breeds of pig and their diet. The old mill is running as it traditionally did, milling wheat flour, corn, rye , buckwheat and spelt flours. Every Saturday during summer – make your own bread. Thermal Spas –Eight spas in the region – Aquensis, Balnea, Bains du Rocher, Cieleo, l’Edenvik, Jardin des Bains, Luzea, Sensoria Rio -make the most of the region’s superb natural resources to create a unique range of spa and wellness products, harnessing the naturally warm and soothing waters. To stay in one of the spa centres of the Hautes-Pyrenees is to discover an area which has more rivers, lakes, mountain torrents and waterfalls than almost all other regions. The air is pure, the climate soft. Spa clients re-charge the batteries with a true mountain style treatment : sunshine, superb scenery, authentic villages, a warm welcome, a traditional and comforting cuisine.